Yesterday, the Joint Committee on Finance passed the University of Wisconsin System Omnibus Motion. I was going to talk about each questionable provision in the bill like the changes to shared governance that would allow administrators to raid fund balances from student organizations (32 and 37), the deletion of the current law that permits the Board to deduct contributions from the salaries of football coaches for a pension (47), or allowing universities to use students’ social security numbers as their student ID numbers (63). However, even though much has been focused on changes to tenure, it’s unclear to those outside the system (and to some inside) just exactly what that means. So, to you, dear readers, I offer a breakdown. 12: Tenure: Approve the Governor’s recommendation to delete the definition of a “tenure appointment” and language establishing the conditions under which the Board of Regents may grant a tenure appointment to a faculty member. Delete current law specifying that a person who has been granted tenure may be dismissed only for just cause and only after due notice and hearing. In addition, delete the definition of “probationary appointment” and provisions limiting the length of such an appointment to seven. This has been probably one of the most extreme measures in the bill, but also the one most likely misunderstood. As the Wisconsin State Journal points out, Wisconsin is the only state that has job protections for tenured faculty written into statutes, a primary reason faculty find System campuses a desirable place despite comparatively low salaries. “The GOP motion calls for the Board of Regents to determine whether to have tenure and what it would entail.” Quickly, System President Ray Cross and the Board of Regents swooped in to save the day, claiming “the board would approve a measure to enshrine tenure in Regents policy at a meeting next week — as they’d promised when removing tenure from state law was first floated by Walker in his 2015-17 budget proposal in early February.” We will see if this promise is, indeed, kept when they meet next week. Here are some common myths about tenure and how it’s granted. Tenure is a lifetime job guarantee. Tenure-track professors routinely get observed by faculty in their departments every semester, sometimes by two different faculty members. Those observations are intended to maintain integrity and make sure the teaching that occurs in their classroom is up to par. If it is not, the university has the right to not retain them. Faculty members are assessed by student evaluations in all classes, in all semesters, so that if there is a negative pattern, the university has the right to not retain them. Faculty members are assessed by the amount of community and professional service in terms of how they positively add to their communities. If they lack in this area, the university has the right to not retain them. Faculty members are assessed by their professional development in the form of conferences, publications, and other forms of research. As a tenure-track faculty member, even at a non-research 1 institution, it is assumed you will publish, regularly, in peer-reviewed academic journals (most with a 3% acceptance rate if they’re a national journal in that field) as well as conducting research in other areas and in other mediums. If that faculty member fails to publish, or publish in credible arenas, the university has the right to not retain them. In addition, faculty members are still assessed in the form of post tenure reviews. In fact, most universities have instituted more stringent post-tenure review processes, generally about every five years. What does that mean? 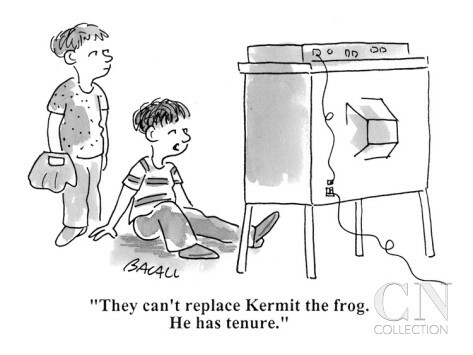 Tenure does not mean one is immune from termination. Having tenure does not protect one from being laid off especially if they don’t continue to excel in the areas of teaching, scholarship, and service. Tenured professors get fired every year for legitimate reasons. Others get fired for illegitimate reasons. But the idea that it is “impossible” to fire a tenured faculty member is just patently false. So, why do we have tenure, when did it originate, and what was its original purpose? In 2015, do we still need tenure as a way of preserving academic freedom and firing without just cause? I would argue yes. Take the case of Dr. Steven Salaita. Or Professor John McAdams. Or the cases at the University of Oklahoma, Felician College and the University of Southern Maine. But even if I haven’t convinced you that these job protections are necessary, that they make universities stronger, let me provide you with personal experience. As an untenured faculty member since 2009, I’ve held my tongue during committee meetings or departmental meetings for fear of angering the wrong person sitting on my evaluation committee who determines, year after year, whether or not I can be retained. As an untenured faculty member, I can be and have been exploited by senior faculty and filed no report for fear of termination or retribution. As an untenured faculty member, I would be less likely to speak publicly regarding these budget cuts and policy changes. As an untenured faculty member, I wouldn’t be blogging right now. Tenure isn’t just about job security–it’s about having a voice. Without tenure, professors everywhere would have little incentive to do controversial work or research, question their own administrators, or file grievances against those who are mistreating them either in terms of harassment or gross misconduct. I highly doubt Professor Richard Grusin would have called for System President Ray Cross’s resignation had he not had the protection of tenure. In addition, if tenure is eliminated or even weakened, who in their right mind will want to work in Wisconsin? As Professor Sara Goldrick-Rab claimed in a recent Facebook posting, “How does one fight without any rights or protections?? The new provisions make it very easy to close my tiny department and the Lab.” What she is referring to is the Wisconsin HOPE Lab, the nation’s first translational research laboratory aimed at identifying new and effective ways to minimize barriers to college completion so that more students can reach their full potential. As Inside Higher Ed notes, “Goldrick-Rab said she passed up a center directorship at an institution in another state several years ago, fearing that shared governance there wasn’t as strong as it was at Madison. But now she’s actively pursuing opportunities elsewhere, she said. ‘I can’t work in an institution without genuine tenure protections and I will not work in academia without shared governance. We cannot protect students’ interests without it. '” For those not familiar with Professor Goldrick-Rab, to say she is a “star” is an understatement. She could work anywhere and is currently a Professor of Educational Policy Studies and Sociology at the University of Wisconsin-Madison. To lose her and any of the immensely talented professors in Wisconsin due to this policy change would be criminal. So, to be clear, when you see faculty freaking out about the elimination and/or weakening of tenure, please understand we have very good reasons. You don’t just get tenure by existing for 6-7 years on a campus. As my partner can attest, I am much happier to live with now that I have tenure, and I worked extremely hard to earn it. I feel free to speak out against injustices happening in my state or on my campus without fear of losing my job. I can speak on behalf of untenured colleagues, students, and staff who don’t have those same protections. Since 2011 and the passage of Act 10, we have seen colleagues resigning from UW institutions at astounding rates. To say we are hemorrhaging faculty and staff would be an understatement. My colleague keeps a list of all the faculty and staff who work on our campus on the back of her door. At the end of the year, she puts an X through the pictures of each who have resigned or retired far before their time. The list grows every year. And with these policy changes, that list will grow exponentially. Vacancies won’t be filled and we will be scrambling to find anyone to teach and work in this state. That is why yes, my friends. Changes to tenure are a big f**king deal. Yes. I Suffer From Mental Health Issues. I’m Not Ashamed. You Shouldn’t be Either. Will the Adults on the Left Please Stand Up?